I've been able to do a fairly consistent sequence of MOC work this week! Strangely it's still surprising many viewers that this second elevated train station has progressed in what I consider a natural direction, from extremely rough when it first started, to gradually more polished after a week of work. Many folks think that when something is first started, that's exactly how it will look when it's finished, a puzzling and somewhat perturbing flaw in their basic understanding of... so many fundamental things. I've also seen a dramatic rise in decisively non-constructive feedback like, "This whole thing is awful," or "Your worst build ever you should do [what I, individual viewer want this second]," again all while things are still being changed significantly from day to day. Actual constructive criticism is something I consistently revel in and reward with thumbs up, hearts, and personal replies due to its value and increasing rarity. However, I definitely don't need to be showered with flat-out one-sided negativity while doing something I enjoy, and I'm not going to reward destructive behavior. Thus, reluctantly, I'm going to start disabling comments on MOC build videos until I'm done with a project. Making custom things, whether physical or digital, is something I enjoy, and I'm not going to allow completely random, anonymous people with zero investment to even try to ruin that. I admire your will to go forward and try new things with new colours. Personally everything I build just turns into grey/dark grey/black and all looks the same. While the red-yellow is not really my thing, I do like the parts you're using. If I may suggest replacing the orange with a more neutral color like brown (or dark blue?). Maybe that would "tone it down" just a little bit because the red and yellow are so vibrant (and I don't think white works here as a neutral color). How do you know what legos pieces to order when you build Mocs?????? While at first I wasn't sure about the colors, I really like the end result. And I always wait until you're finished, because I know that you go through a process and it's always fun to see what comes out. I get the negative comments issue. It really IS destructive. That sort of behavior prevents a lot of creative people from expressing themselves. Good for you to shut it out and do YOUR thing. Go Jang, can't get how anyone can critisice your work on here. You constantly say that new Jang city is your personal project and you make the rules. If someone doesn't like what you are doing, don't watch, it's easy. I personally admire watching people create with Lego, or model kits (my other hobby), and whilst there are things I would often do different it's always good to draw inspiration from others. For the record: I do NOT think it looks like McDonalds. I like where you're going with this. Keep up the good work. I enjoy every video you publish and already look forward to the next one! 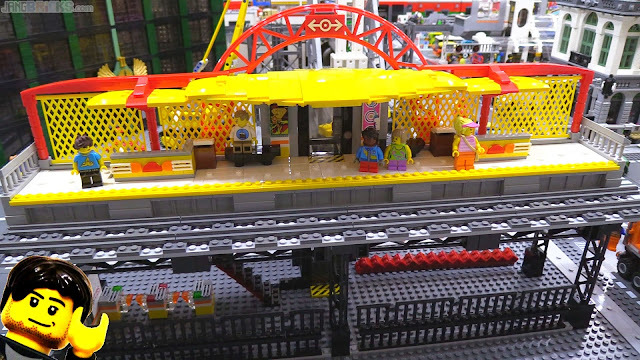 Looks really good so far, getting some London DLR vibes from the elevated design. Awesome!